STL 250 is a full range active loudspeaker of bi-amplified design with 200W + 50W RMS featuring a “10” neodimium woofer and “1” horn. Class D switching amplifier (ICEpower? by Bang & Olufsen ICEpower). It is Ideal for live music in medium size locations and applications such as piano bars, restaurants and club entertainment. Endowed with the Physiocon2? processor, the frequency response is exceptional and the cabinet is capable of projecting high output levels throughout the full spectrum of frequencies. With the special shape of the cabinet, the 250 can easily be used as a stage monitor if required and is both lightweight and exceptionally compact For even greater output and bass response just add one or more STW 250 subwoofers. 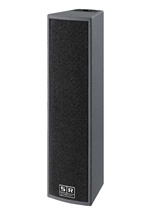 The STL 250 comes with a 40 mm-bored flange on the bottom suitable for a standard speaker floor stand. STL 400 is a full range active loudspeaker, of bi-amplified design offering 320 + 80W RMS output featuring a “12” woofer and “1” horn, both of which are neodimium in construction. Class D switching amplifier (ICEpower? by Bang & Olufsen ICEpower). Ideal for live music both indoor and outdoor the STL 400 is suitable for a wide range of applications such as bands and DJ performers and the new processor TSS? keeps the internal amplifier at maximum efficiency, guaranteeing both high sound pressure and audio fidelity. With SR's Physiocon2? processor exceptional performance at all frequencies and volume levels is assured and yet the STL 400 is still very portable and extremely light.For even greater output and bass response just add one or more STW 600 subwoofers. The STL 400 comes with a 40 mm-bored flange on the bottom suitable for a standard speaker floor stand. The most powerful of the STAGE LINE series, perfect for large discotheques and outdoor concerts. STL 1000/A is a full-range 1000W RMS speaker, equipped with 3” horn (B&C) and 15” neodyme woofer (Eighteen Sound). Internal 200 W Mosfet amplifiers for the trumpet and 1000 W Class D switching (ICEpower? by Bang & Olufsen ICEpower) for the woofer. It can be used alone, thanks to the Physiocon2? processor which regulates equalization automatically and to the new TSS? processor which keeps the internal amplifier at maximum efficiency guaranteeing considerable sound pressure, or connected to the STW 1600/A subwoofer, with Physiocon2 disabled. The sound pressure (132 dB) and horn size with 60?x40? opening allow to reach considerable distances without sound regression. Thanks to the 7 M8 fixing points on the upper and lower panels and the sockets for the power “re-launches”, it is possible to create vertical arrays of up to 3 suspended speakers. The size is contained (46x48x75 cm) and the weight is just 40 Kg, decidedly little for an active speaker, in wood, of this power. Coverage angle Horizontal 60? Vertical 40? STW 250 is an active subwoofer providing 250W RMS through a “10” speaker. This new design which is extremely compact provides exceptional low end performance and projection. 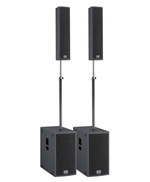 It is ideal for a wide range of small and medium sized venues and is ideal for connection to the following speaker systems: STL 250, CLUB 150/A, MON-X and Live 220/A. A standard speaker pole fitting is provided in the top of the cabinet. STW 600 is an active subwoofer providing 600W RMS, 15” speaker and features Class D switching amplifier (ICEpower? by Bang & Olufsen ICEpower) technology. A great choice for the professional user the STW 600 is suitable for a wide range of applications both indoor or outdoor. With its totally new design, compact size and low weight the 600 enables incredible projection of bass frequencies yet is portable enough to be considered by any performer. 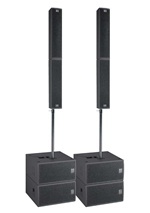 The STW 600 is an ideal partner for STL 400, Live 350/A, Live 550/A speaker systems. A standard speaker pole fitting is provided in the top of the cabinet. The STW 1000 is a 1000 WRMS amplified subwoofer, with an 18” Neodymium speaker. It features a Class D switching amplifier (ICEpower? by Bang & Olufsen ICEpower). An ideal choice for professional users, it is suitable for all music genres and can be used indoors or outdoors. Its new design makes it compact and light for easy transport. The new box design produces a noticeable sound pressure and great projection over long distances even when used outdoors. The STW 600 is recommended in conjunction with STL 400 and STL 1000 systems. A 40mm standard speaker pole fitting is provided in the top of the cabinet. 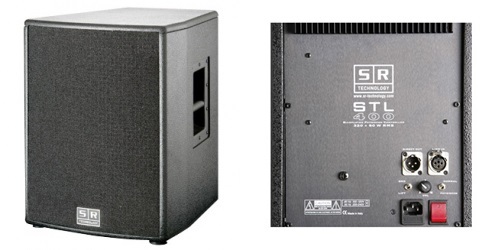 STW1600A is a 1600 W subwoofer, dual-amplified, with internal 100 Hz crossover. The crossover is both mono and stereo, so that the subwoofer can be connected to one or two satellites. To contain the size and weight of the subwoofer it has been manufactured with only one 21" speaker (specifically created by Eighteen Sound) with double coils. The speaker is driven by two final amplifiers with class D digital power of 1000W each, which guarantee dynamics and a considerable sound pressure (134 db). Each of the two amplifiers drives one of the two coils working at a power of 800W each, for a total of 1600W RMS. The weight of the speaker is only 65 Kg, half that of the other active subwoofers of this category available on the market. DIMENSIONS 16.5 x 68.5 x 18.5 cm.